According to AP, Bark beetles and old age have damaged Leonardo da Vinci’s 15th-century painting “Lady with an Ermine,” but the masterpiece is still holding up well, according to a conservationist at the Polish museum where it is displayed. Recent tests show the chestnut board on which Leonardo painted his masterpiece has weakened after being nibbled at by beetles over the centuries, and the painting has also suffered from a dense network of cracks, said Janusz Czop, the chief conservationist at the National Museum in Krakow. 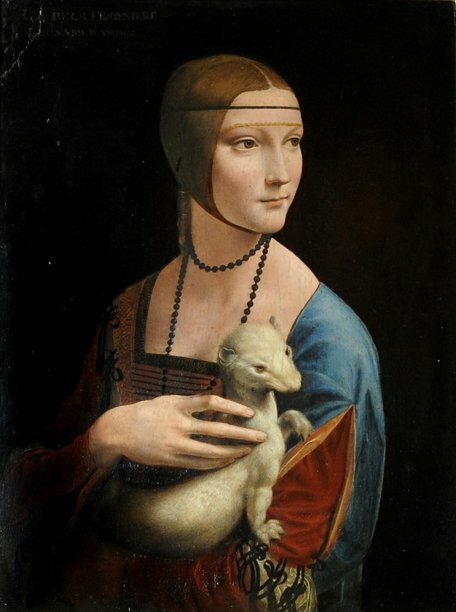 One of only four existing female portraits by Leonardo, the oil painting shows a young woman in three-quarter profile wearing a sumptuous low-cut red and blue dress as she holds a white ermine, an animal also known as a stoat. Historians believe the subject was Cecilia Gallerani, the mistress of the Duke of Milan, Ludovico Sforza, when she was 16 or 17. Leonardo painted it around the year 1490. “The painting is 500 years old and has been subject to all the processes of aging,” including journeying between Poland, France and Germany through the wars and uprisings of the 19th and 20th centuries, Czop said Monday. “Still, all things considered, it is in very good condition, thanks to the technology that da Vinci used,” Czop said, noting the master painted on durable wood. More state-of-the art and noninvasive tests — such as computer tomography — are to be performed to help experts decide what kind of maintenance the masterpiece requires, Czop said. For the past 100 years the painting has belonged to the Czartoryskis, an aristocratic Polish family. The painting was recently exhibited in the Spanish, German and British capitals but Czop said those trips did not hurt it. Nonetheless, authorities have decided not to let it leave the museum again for at least 10 years.